Federal Communications Commission (FCC) Chairman Ajit Pai today unveiled his plans for scrapping net neutrality rules enacted by the Obama-era FCC. Pai has made no secret of his distaste for regulations in general and, specifically, for rules enshrining net neutrality, the principle that all users of the internet should have equal access to it. What that means in practice is that big companies can't build high-speed channels for themselves while everyone else is jammed up in the slow lane. The Obama FCC enacted the current set of rules in 2015 over the objections of big telecom and cable companies who said the government was overstepping its authority and legislating to fix a problem that did not exist. 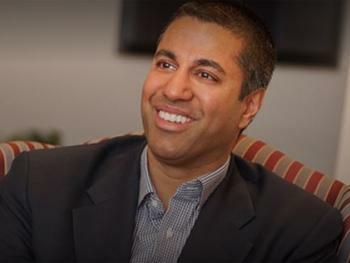 Today during a speech at the Newseum in Washington, Pai said the simplest way to get rid of the existing rule is simply to hand regulatory jurisdiction of broadband providers back to the Federal Trade Commission. Pai said he favors net neutrality principles but thinks industry can regulate itself to avoid major problems. “That’s like saying you value math, but you don’t value numbers. We can’t keep the promise of net neutrality without the rules,” said Sen. Ed Markey (D-Mass. ), prior to Pai's speech.